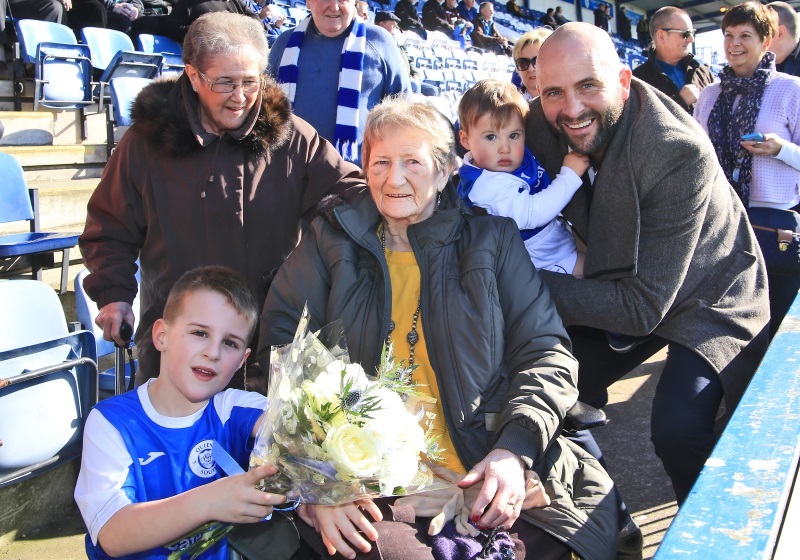 It was a good day all round for Jean Henderson on Saturday, the Queens fan celebrated her 90th birthday at Palmerston watching the side romp to a six goal victory over Dumbarton. Jean the widow of Queens legend Roy, who was goalkeeper through the club’s best period in the early and mid 1950s making 381 first team appearances has been a regular at Palmerston for many years. It was a family celebration as mascots, six year old Findlay Hall and 16 month old Oliver Alistair Urquhart are Jean's great grand-children. Queens Community & Commercial manager, Jim Thomson took time out before kick off to make a presentation to Jean. The former defender said "Jean has been a familiar face and avid supporter of the club for a very long time. She might not be as fit as she used to be, but she still comes along to the home games to cheer on the side. Her support is very much appreciated, so we're more than happy to do our little bit to make her 90th birthday special".